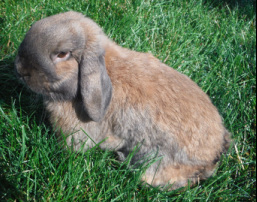 Background: We got Pippin from Holland Lop Hollow in 2013. He lived inside for a while and is unbelievably sweet. I showed him at our local 2014 fair and he did great at the table for showmanship. Background: We got Buster from Leslie's Bunny Barn in Klamath Falls. He is a proven buck and we hope to get some nice kits from him. He is the most tolerant rabbit I have ever met. You can literally do ANYTHING with him. He's a sweaty. He has won a few ribbons and is pretty good in showmanship. IF he's not next to a doe. Background: Theo was bought from a woman from Idaho at the 2015 National ARBA Convention. 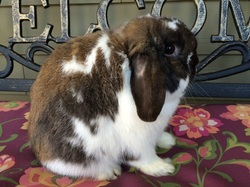 He is a wonderful, and has become my showmanship rabbit. We absolutely love him to death. 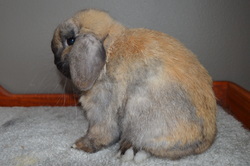 He won Champion Holland Lop at his first show with me. Background: Nips' mother was bought from a breeder in The Dalles, OR and was pregnant when we got her. She had four healthy babies but died when they were three weeks old. Nips was kept since then and is a awesome pet. All Jersey Woolies do need grooming and are not ideal for really young kids. Background: Hasem shows lots of potential at a young age. He is a bit cut off on his rear, but he has a good top line. His head is excellent, but he is a tiny bit bell legged. He has great fur texture and length, but I would like to see a richer chestnut on him. Hopefully that will come in with age. I really like the depth between his eyes. I like the straightness and thickness of his ears also. Background: We got Floyd from a friend of mine. He is very sweet, and is easy to pose. He won Champion Champagne D'Argent at the 2015 Oregon State Fair. He is the father of Twitch, our other Champagne.